When it comes to Afghanistan, the US really did not need any more dramatic developments to say the least. But as June became the deadliest month for the U.S.-dominated military coalition in Afghanistan, drama is exactly what has escalated. In the past few months, we have seen the US openly bashed by their once Afghan “Puppet President”, aka Hamid Karzai, who with his threats of joining the Taliban himself not only set off rumors of his own drug use, but signaled that US control over Afghanistan was loosening. Then there was the release of “Warlord, Inc,” the Congressional Report that basically reveals how getting supplies to US troops in Afghanistan is “so tricky” that the US has been funding Afghan warlords to protect its cargoes carrying supplies for US troops from being attacked. To add salt to the US’ open wounds, Karzai announced last weekend that it would be Japan and not the country with about 90,000 of its troops stationed on Afghan soil that would get priority over the rights to mine what could be trillions of dollars worth minerals in Afghanistan. However it has been during the last 24hours that we have seen some of the most intense moments unravel in the drama that is the US War in Afghanistan. On Monday it was revealed that US General Stanley McChrystal had given an interview to Rolling Stone magazine in which he openly criticizes Obama and some of the top officials in his Administration. Obama reacted by summoning McChrystal to Washington for a personal meeting, setting the media ablaze with posts and articles on the fate of the top US General in Afghanistan. [McChrystal’s] scathing published remarks about administration officials undermine civilian control of the military and erode the needed trust on the president’s war team…This is a change in personnel but it is not a change in policy. I welcome debate among my team, but I won’t tolerate division. While one can take their pick of explosive quotes about the Obama Administration from McChrystal’s interview to Rolling Stone magazine, what I think the real message is that this general didn’t believe this war was winnable with Obama’s policies. But what I just can’t get my head around is why did he give the interview to Rolling Stone in the first place? Surely he knew Michael Hastings was going to publish this interview. He’s a journalist! It’s Hastings’ job to run with this story! So why would McChrystal let his guard down, give such a candid interview, and make such a self-destructive move? His reckless interview cost him his military career. National Public Radio (NPR) ran an excellent piece yesterday on the historical tension between Generals and their civilian bosses. But it still doesn’t answer the questions as to why McChrystal would go on the record about what he really thought about this Administration’s policy on the Afghanistan war. 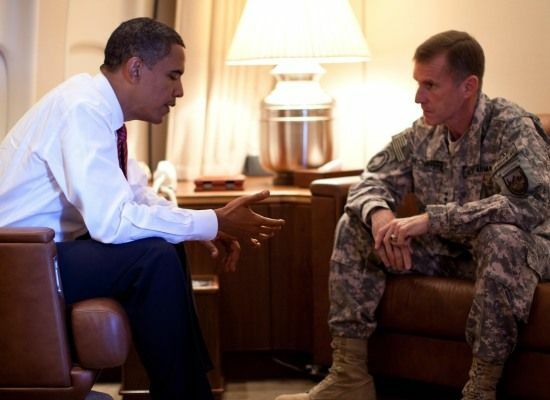 McChrystal isn’t pursuing his [Obama’s] foreign policy. 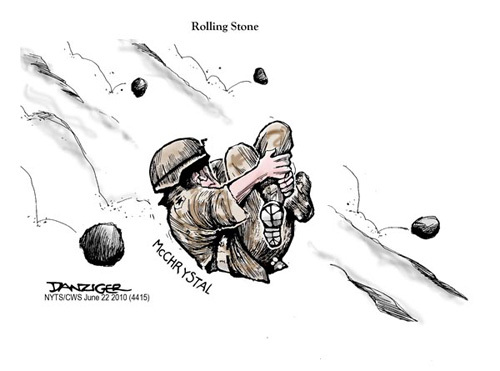 McChrystal wants to “win” the war in Afghanistan (whatever that means) no matter what it takes. Obama believes that doing whatever it takes will cost the U.S. so much money…that it will cripple his efforts to stabilize America’s finances and rebuild American economic power. That’s the struggle that Hastings exposes. At the end of the day, it comes down to the fact that there was a general who wanted more troops to make his army better equipped to fight an (un-winnable?) war, and a President who wants to slowly start drawing the curtains on this nine year old conflict. And that is why he lost his job. Whether McChrystal’s interview was an intentional cry for help to be relieved as the senior general of the Afghan war, or if it was just his ego talking, we do not know. For now at least.